You stroll into town as the warm sun rises over the calm water of the Gulf of Mexico. Collared Doves coo overhead but the only other sound is the gentle lapping of water and the occasional whir of a passing golf cart. You wander into Holey Moley to order a bacon maple donut and a cup of coffee and looking up from the deck you are shocked to see a bright pink Roseate Spoonbill flying over. On the way back to your room you stop by the break wall and watch the Anole lizards emerging to greet the sun as they extend their huge colorful dewlaps to impress the females. 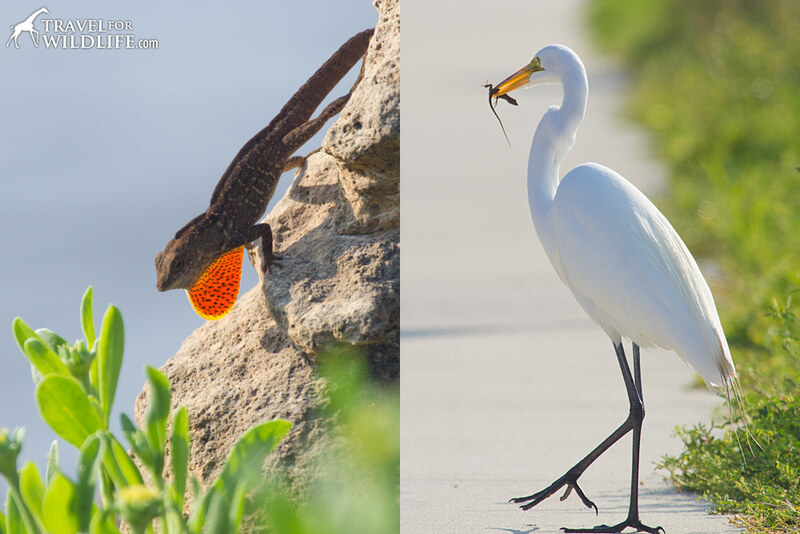 The only other pedestrian on the side walk is a Great Egret, snapping up anoles for breakfast. Back at the Faraway Inn you grab one of the free kayaks and slip into the water off the small beach. Sandpipers peep and skitter as you push off. An Osprey cries from above while a squadron of Brown Pelicans cruise by just inches above the water. As you round the corner and head toward the uninhabited Atsena Otie Key, you hear a familiar “PUFF” sound to your right: a sharp exhaling of breath. You catch a glimpse of a dorsal fin as it glides under the surface. The Atlantic Bottlenose Dolphins are already making their rounds. It’s going to be another beautiful day kayaking with dolphins in Florida. Florida can seem like a land of extremes. One second you’re in the impenetrable swampy wilderness and the next you’re in an over-developed nightmare of high rise condos and paved suburbia. It can be a serious challenge to find just the right combination of small town charm, decent tourist accommodations, and unspoiled nature. That’s why we were a bit shocked when we discovered Cedar Key. 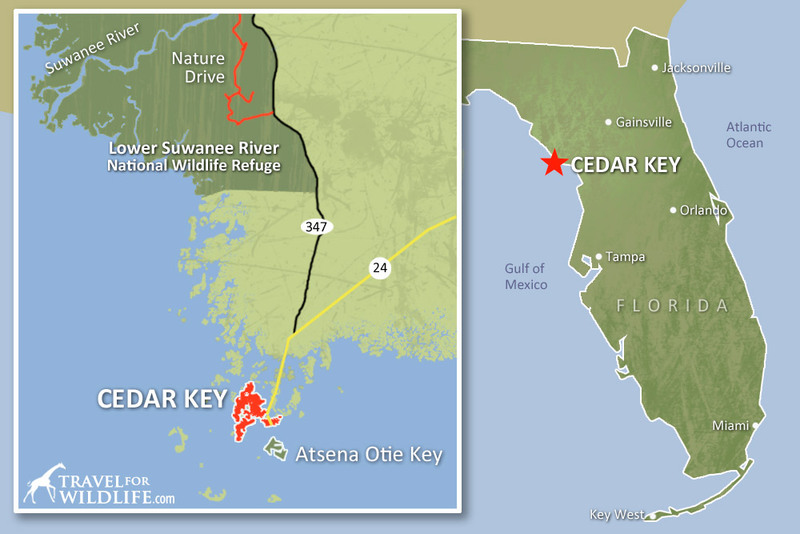 Map of where to see wildlife around Cedar Key, Florida. I knew we were entering a different kind of place when the approach to the island turned out to be twenty miles of lonely two-lane highway through nearly uninhabited wilderness. It felt a bit like we were traveling back in time to a lost world. And sure enough, upon crossing the final bridge to the small island, it seemed as though we had somehow discovered a piece of old Florida. Yep, you’ve taken a step back in time. 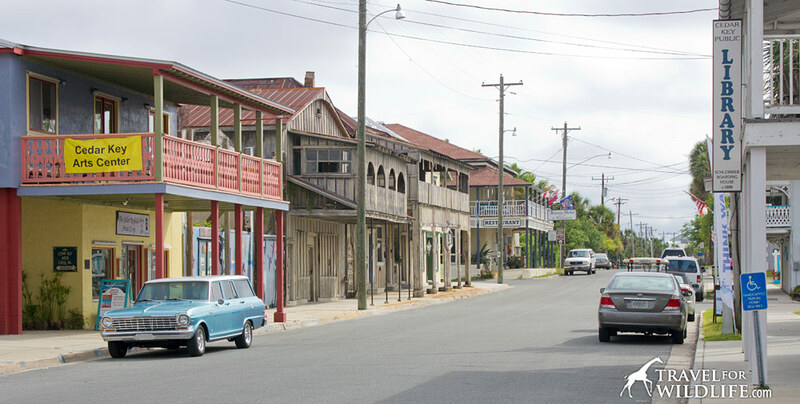 Welcome to downtown Cedar Key, Florida. There were no strip malls, no chain stores, and no fast food restaurants. Only a cute little downtown and a large wooden dock covered with low-key restaurants and shops. “Wow, it’s so quiet here!” We would find ourselves repeating that sentence many times over the next two days. Cedar Key is the kind of town that cares more about preserving their ancient live oaks than straight sidewalks. 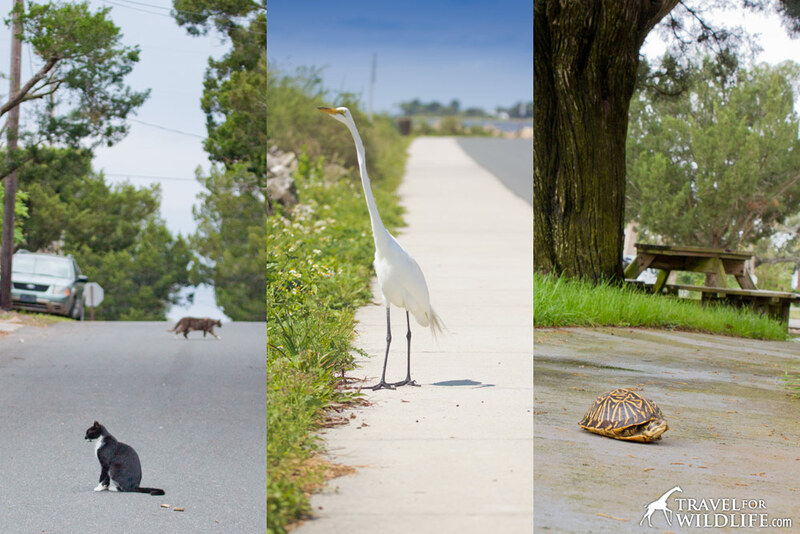 It’s the kind of town where you can walk down the center of the road and you’re more likely to run into cats, egrets, or even a Florida Box Turtle than a car. It’s the kind of town that I could actually see myself living in, and I have to admit, that’s a first for Florida. 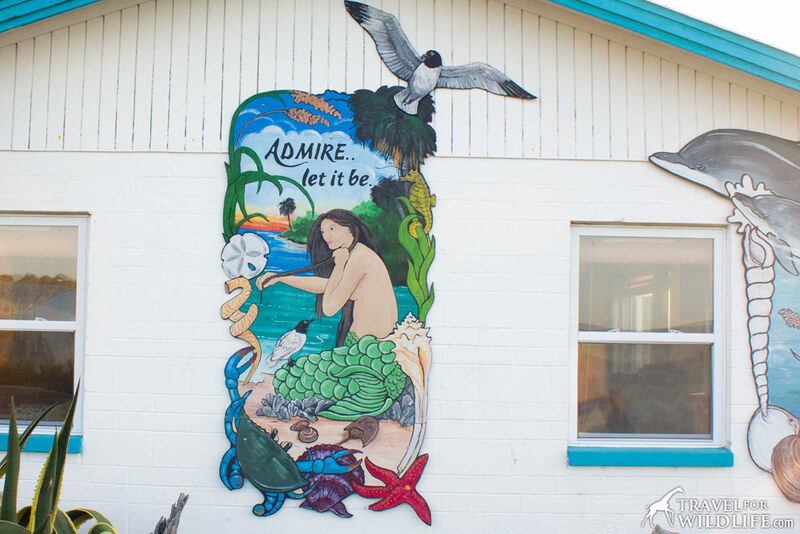 We enjoyed ourselves so much that three months later we decided to return and find out what other wildlife encounters Cedar Key had to offer. 1. Kayaking with Dolphins in Florida. 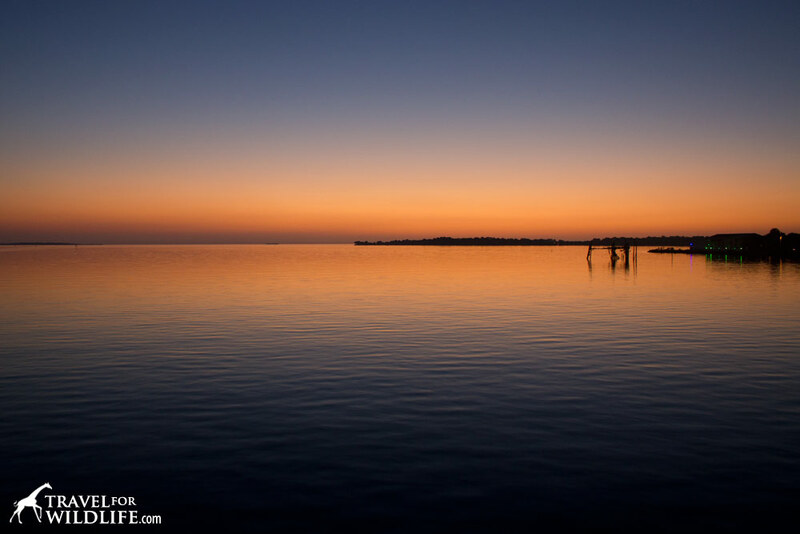 Why Cedar Key is at the Top of Our List. 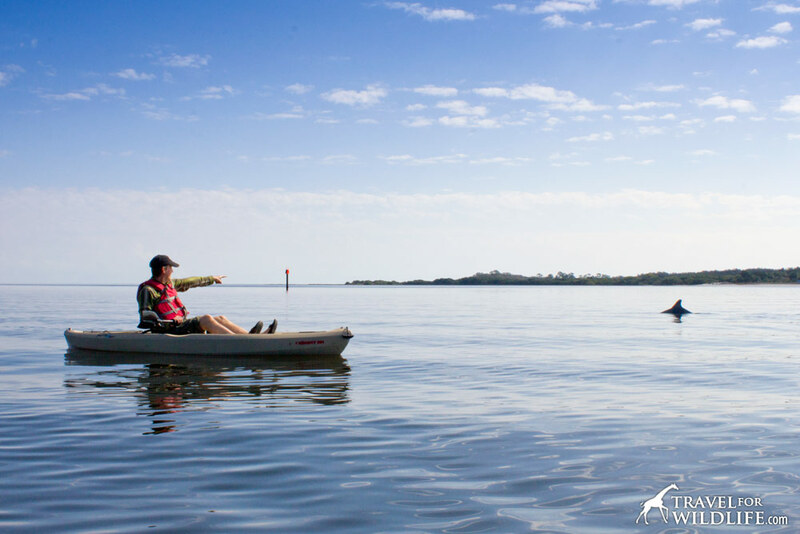 We’ve watched dolphins in many places, but paddling from Cedar Key ranks as one of the most accessible, peaceful, and dependable places to go kayaking with dolphins in Florida. We stayed at the Faraway Inn (read more below in Where To Stay) because they offer free use of kayaks to guests. Simply roll one of the kayaks across the street to the small beach and paddle out toward Atsena Otie Key. Within five minutes you will begin spotting dorsal fins breaking the surface, or hear breathing around you. At times it can feel like you are surrounded. We haven’t had one approach our kayaks closely, but it is awesome to watch them going about their business, traveling, hunting, playing, and taking care of their babies. Kayaking with dolphins in Cedar Key Florida. Atsena Otie Key in background. We’ve paddled in mid January and mid April and had great luck seeing dolphins both times. Atsena Otie is a great destination in itself and you can reach this deserted island within about twenty minutes of relaxed paddling. Here you can pull out on a sandy beach and go for a swim with nobody else around. 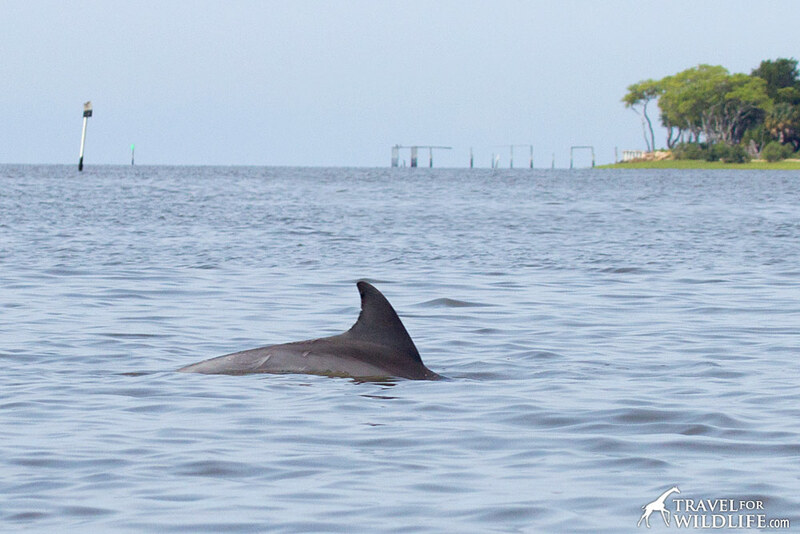 Cedar Key is without a doubt one of top places to go kayaking with dolphins in Florida. There are some walking trails on the island where you can visit the old cemetery, and even use a restroom! Also there is an old dock that has been preserved as a bird roosting sanctuary. It is a great place to see Brown Pelicans, Double-crested Cormorants, and various gulls and terns. The old dock on Atsena Otie Key is now a bird sanctuary. Or if you are feeling energetic, you can kayak around Atsena Otie Key and paddle alongside mangroves, marshes, and oyster beds. You may also run into manatees on their way to the springs in Crystal River. Listen for breathing and watch for their noses breaking the surface or the tell-tale whirlpool shape they leave when paddling their big round tails. There are several outfitters in Cedar Key that offer kayak rentals and tours if you don’t have access to a kayak. 2. Bird Watching on Cedar Key. 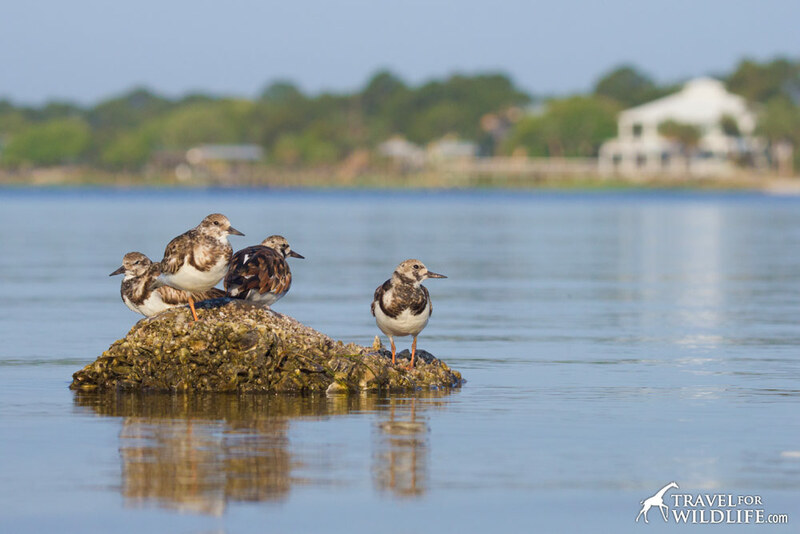 You don’t have to visit a refuge to see birds in Cedar Key. Just walk around town! As you walk across the street from the Faraway Inn to the small beach, you’ll see a pair of Ospreys nesting in a chimney on the house to your right. In April they were very busy with nesting activities. This beach is a great place to see small shorebirds like plovers, sandpipers, and Ruddy Turnstones. Head into town along the waterfront in the morning and there is a long breakwall of large stones to your right. Here you will see hundreds of Brown Anole lizards soaking up the sun, skittering around, and displaying their large dewlaps. Watch for a lizard performing “push-ups” and then you’ll see the dewlap display immediately after. If you time it well, you will see a Great Egret strolling the sidewalk and staring into the stones. Soon it’s neck will weave back and forth like a snake charmer and then WHACK! It grabs an anole, heads back to the sidewalk, and swallows it down. I saw this egret consume at least four in a fifteen minute period! 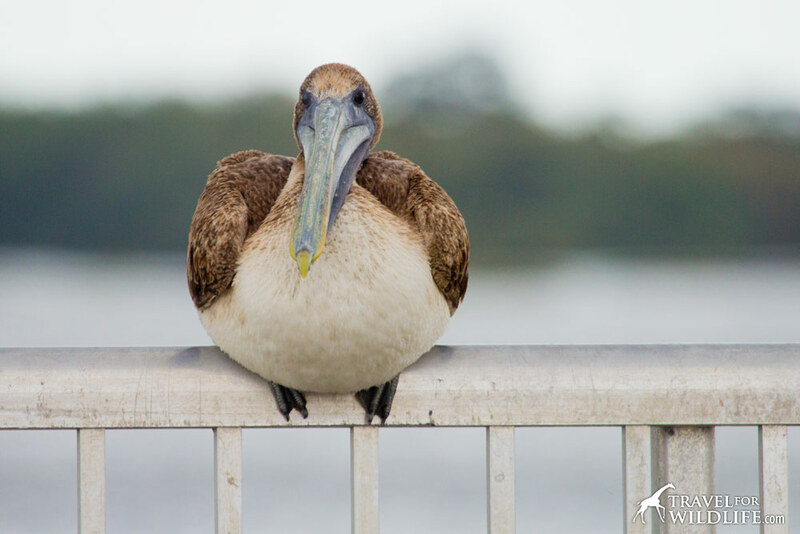 Walk out onto the public pier and you’re likely to see large Brown Pelicans hanging around on the railings watching the local fishermen. A juvenile Brown Pelican sitting on the railing of the public pier in Cedar Key. Stop in at Holey Moley and sit on their lovely little deck with a donut and watch life move slowly by. But keep an eye on the sky. We saw a flock of rare Roseate Spoonbills fly over while eating our breakfast. Until that moment, we thought you could only see Roseate Spoonbills on Sanibel Island at the J.N. Ding Darling National Wildlife Refuge. 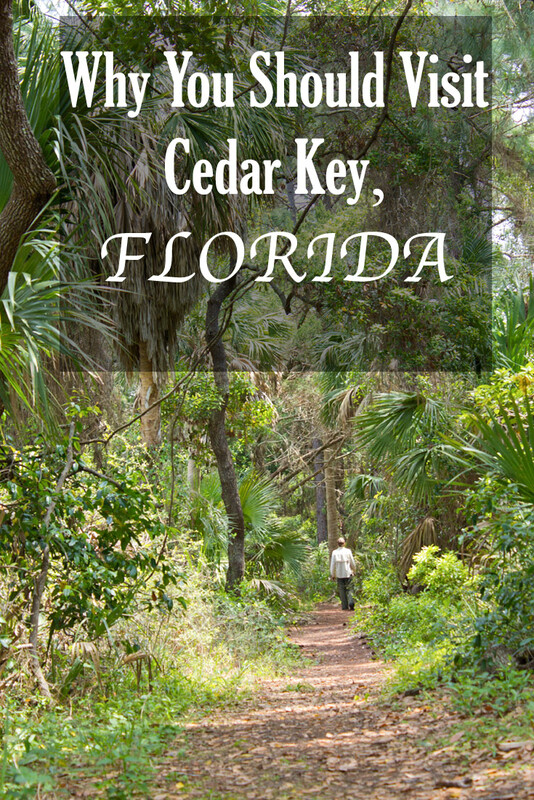 Score another point for Cedar Key! But perhaps our favorite in-town bird watching site of all is from the balcony of Steamer’s Clam Bar and Grill. Get here a little before sunset and ask for one of the three outdoor balconies. Hanging twenty feet over the water, you can enjoy a delicious cocktail and an excellent panoramic view of the gulf and the outlying islands. Pelicans and cormorants will cruise by heading to roost on Atsena Otie Key, dolphins are easily viewed in the calm waters, and in January we had a huge flock of Black Skimmers zoom right over our heads. It was awesome! Black Skimmers skimming, photographed from the balcony at Steamers Clam Bar! 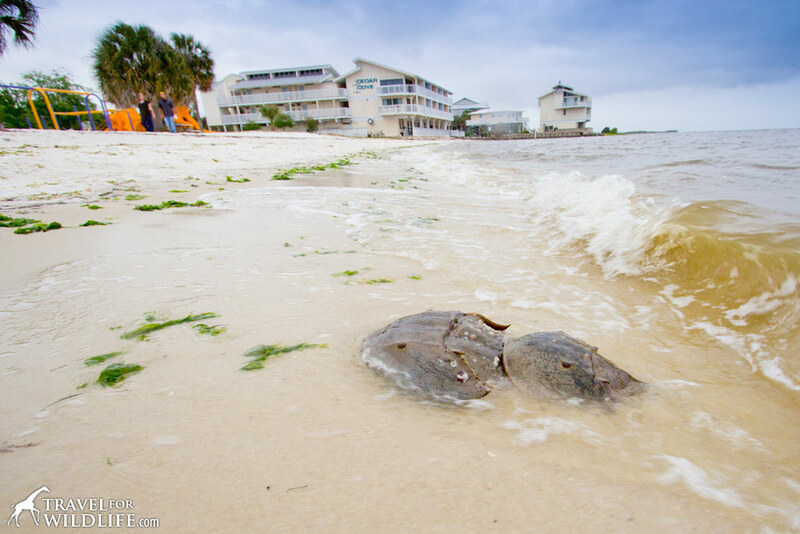 Horseshoe Crabs are some of the most fascinating creatures you could hope to run into, and Cedar Key is one of the few places where you have an excellent chance of spotting them! Horseshoe Crabs mate on beaches with low wave activity and the gentle waters around Cedar Key make it a popular nesting site. Mating activity peaks in spring (March through June) and the time to see them is at high tide during the three days before and after full moon and new moon because of the extremely high tides. The two best places to see them on Cedar Key are on the beach in front of the Cedar Key City Park in town, and the small beach in front of the Faraway Inn. If you are lucky enough to spot a pair mating, you’ll notice the smaller male grabbing onto the back of the larger female. He fertilizes the eggs as she lays them in the sand. 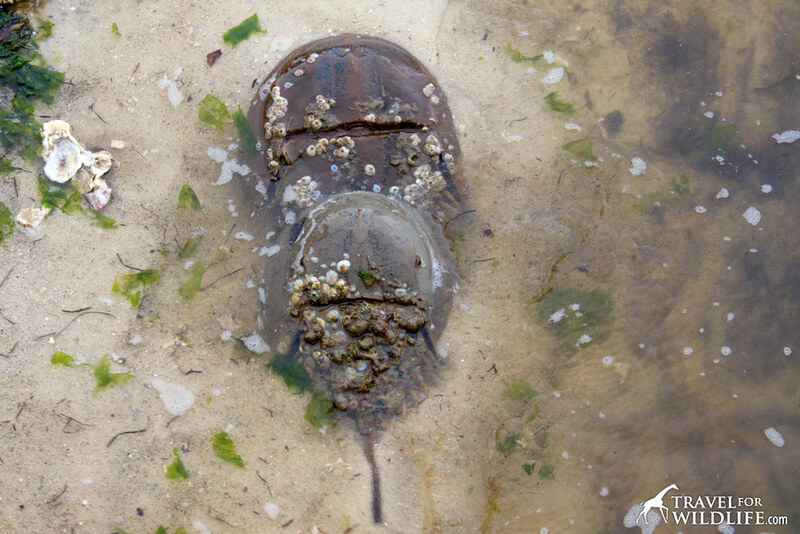 Horseshoe crabs are not crabs at all but belong to a class of animals called Merostomata. They are more closely related to spiders and scorpions (Arachnida) than to true crabs (Malacostraca). The smaller male horseshoe crab clings to the back of the larger female. 4. Lower Suwannee Nature Drive: Gators and Owls and Snakes, Oh My! After you’ve had your fill of dolphins and pelicans, it’s time to head inland to see an entirely different collection of Florida wildlife. Only fifteen minutes north from downtown Cedar Key is the entrance to the Lower Suwannee National Wildlife Refuge nature drive. You can pick up a map at the Cedar Key Chamber of Commerce visitor’s center. Yes, you can actually go “way down upon de Swannee River” as in the famous song written in 1851 (although composer Stephen Foster had never actually set foot in Florida.) We’ve visited many national wildlife refuges but this one is a real hidden gem. It protects one of the largest undeveloped river estuary systems in the United States and includes a startling variety of habitats. In fact, we love it so much that we decided to write a separate article on the Lower Suwannee nature drive and River trail here. 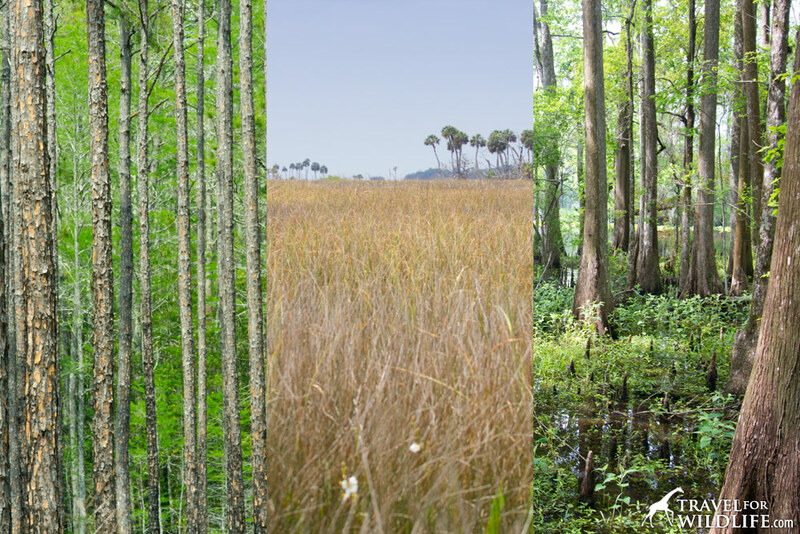 From pine forest to salt marsh to cypress swamp, the Lower Suwannee NWR encompasses a wide array of habitats and wildlife. 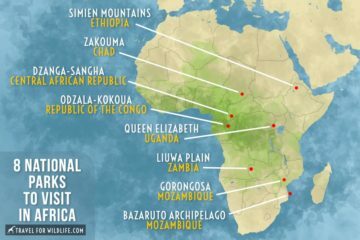 These diverse habitats are home to an even more impressive number of animals. 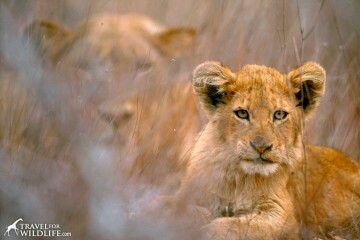 From just one lap around the wildlife drive we had an incredible array of sightings. On Cabin Road we had to drive very carefully to avoid running over the many fiddler crabs in the road. Other invertebrates that caught our eye were Palamedes Swallowtail Butterflies feeding on thistle, beautiful dragonflies in the salt marshes, and a huge Golden Silk Orb Weaver spider in the cypress swamp. Interesting invertebrates we spotted in Lower Suwannee NWR. 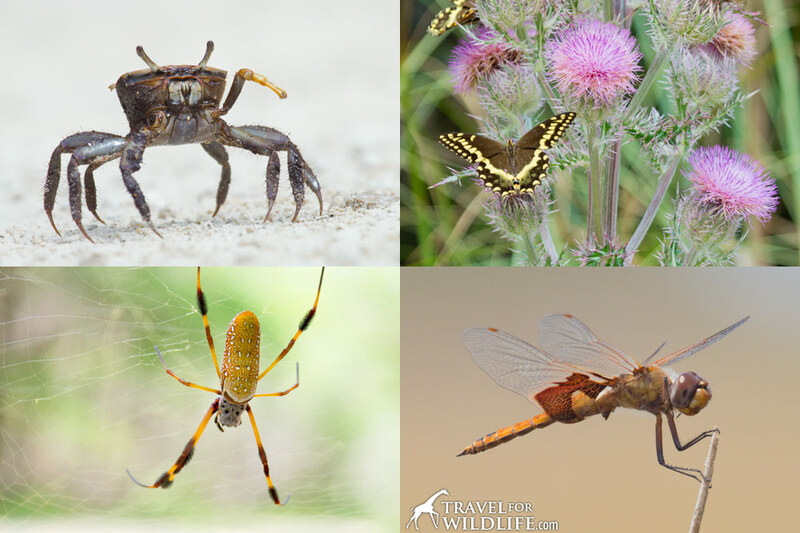 Fiddler crabs, Palmedes Swallowtail Butterflies, Golden Silk Orb Weaver Spider, and Dragonflies. We also had no shortage of reptile sightings. Carolina Anoles were displaying their dewlaps on the boardwalks, several different snakes were sunning themselves in the road, skinks were slinking around the cypress swamp, and we even had a fun sighting of the fascinating Florida Softshell Turtle. And of course, what visit to Florida would be complete without a few gators. 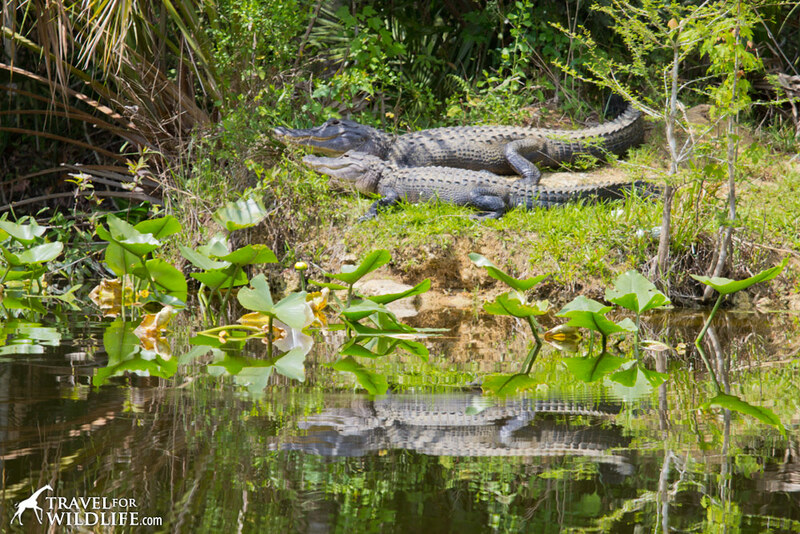 We spotted alligators sunning on the banks of nearly all the large ponds (or swimming across them) as well as few in the cypress swamps. There were even a couple sitting right on the road. They tend to be a bit skittish here so approach ponds slowly and quietly if you want to watch them sunning. Alligators on the bank of a pond in the Lower Suwannee NWR. Some of our favorite bird sightings included a pair of large and colorful Pileated Woodpeckers and a very silent Barred Owl. 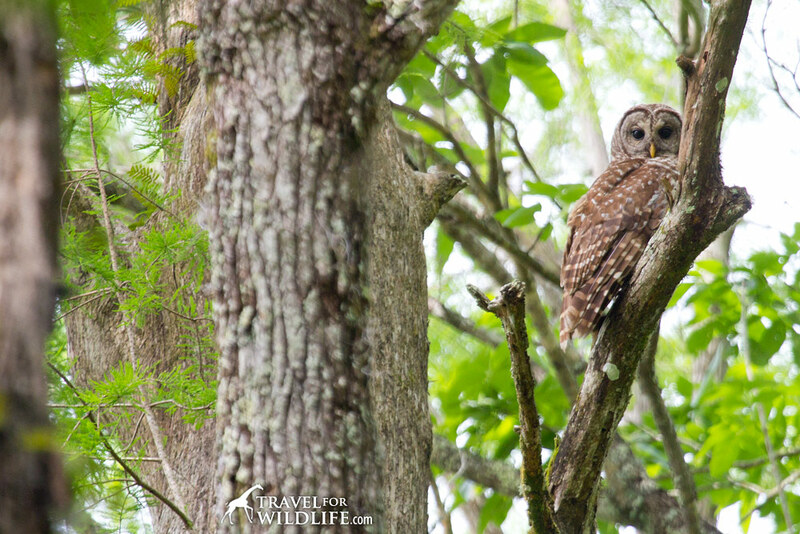 Cristina first spotted this owl sitting, like any other visitor, on the observation deck overlooking the Suwannee River at the end of the river trail boardwalk. Though I was hoping to catch a glimpse of a River Otter, our only mammal sightings were the numerous (and surprisingly small) Eastern Gray Squirrels, and a brief glimpse of a Raccoon crossing the road. Not a bad day all in all. If you’re lucky you may spot black bear, white-tailed deer, and armadillos! If we had known what an incredible place the Lower Suwanee National Wildlife Refuge was, we would have planned our visit so we could squeeze in another drive in the morning or evening. 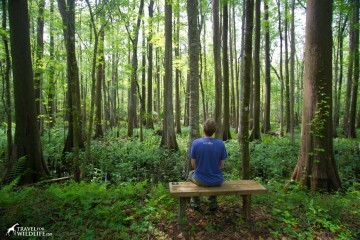 Read more about Lower Suwannee on our post. If you’re visiting in the winter, and you want to see manatees, it’s definitely worth taking a day trip to Crystal River. It’s about an hour away but it’s worth it. 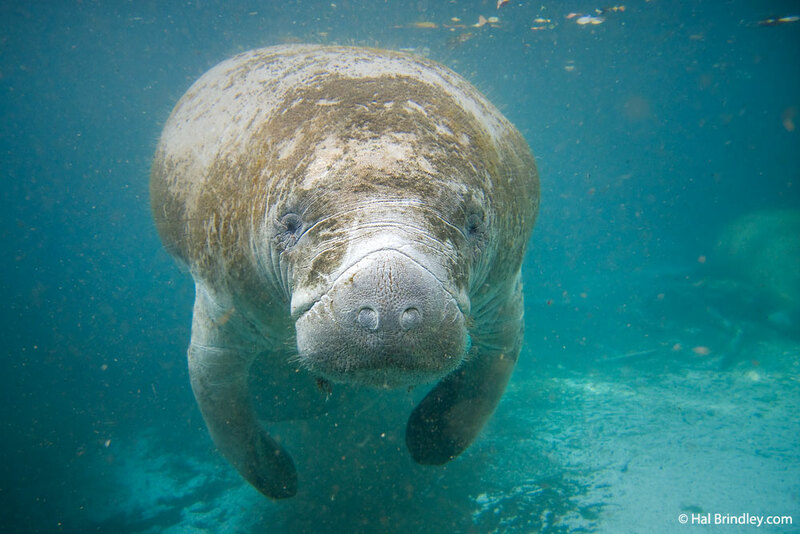 It’s the only county in Florida where you are allowed to get in the water with these endangered marine mammals and it is an amazing experience. 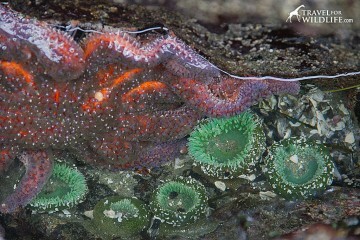 You can either take a tour to swim with them, or you can watch them from kayaks, or even from the bridges around town. Swimming with Manatees in Crystal River is one of the world’s great wildlife experiences. January and February are the best months because manatees gather in large numbers in the warm waters of natural springs. To learn more about this wildlife encounter, check out our article How To Swim With Manatees in Crystal River. We discovered the Faraway Inn quite by accident. My mother booked us a small cottage there on our way back from Sanibel. Now I can’t imagine staying anywhere else in Cedar Key. 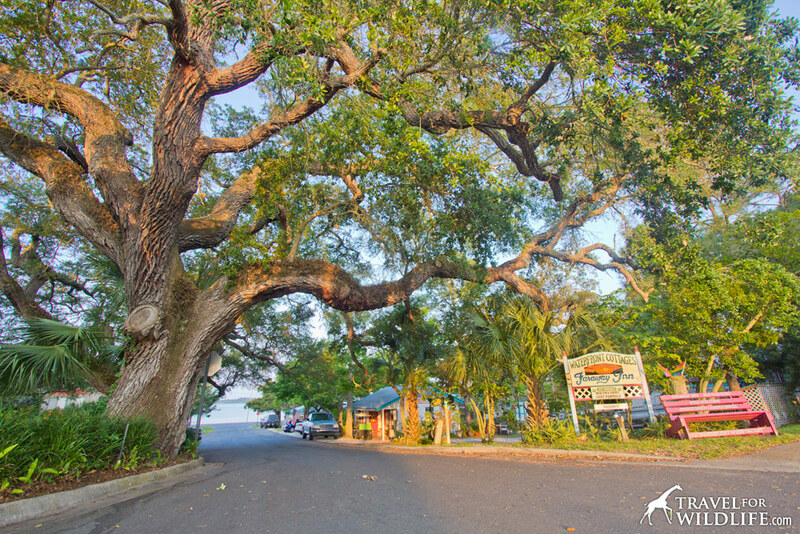 Pass under the branches of this ancient live oak to reach the Faraway Inn in Cedar Key. Although there are several other lodging options to choose from on the island, this place has everything we could want. The location is perfect, tucked in a cute residential area, yet right on the edge of downtown. But more importantly, it’s right on the water. There is a small beach directly across the street which is the perfect place to launch a kayak. The kayaks are free for use by guests so there’s no need to rent one or bring your own. Just jump in the water and kayak with the dolphins! The small beach is a great site to watch shorebirds or to see mating horseshoe crabs in the spring and fall. Our cabin had a kitchen which was great when we wanted to prepare food, and the grounds are beautifully landscaped with loads of plants and kitschy lawn decorations. 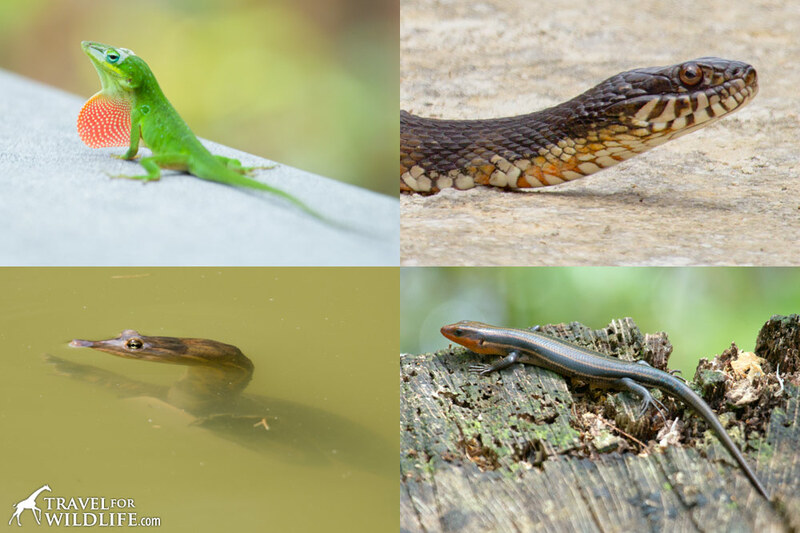 The property is even a certified wildlife habitat by the National Wildlife Federation and you will find many anoles and birds enjoying this habitat. The grounds of the Faraway Inn is a certified wildlife habitat and the lizards agree. The sign on Cottage 1 at The Faraway Inn in Cedar Key. Admire.. let it be. We couldn’t agree more! Doreen and Oliver have also been very active in helping the local feral cat population with a trap – neuter – return program which Doreen founded in 2006. Since that time they have trapped and neutered over a thousand feral cats, given them complete health checkups, vaccines, and a microchip, and then returned them. So you know that when you stay here, you are also helping the local kitties. Isn’t it great? And of course you’ll get to meet the lovely kitty who lives on the premises named Turtle. 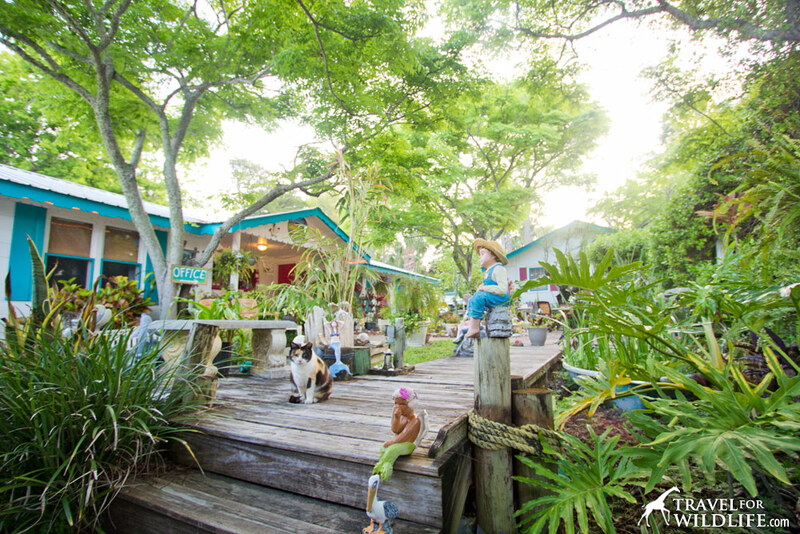 Add to all that, free wifi, free bicycles for guests, and golf cart rentals available on site, the Faraway Inn is the perfect choice for wildlife travelers visiting Cedar Key. We recommend you stay at either Cottage 1 (this one has sea view), Cottage 2, or Cottage 3. These three cottages have lots of light, lots of room, you don’t share walls with another unit, and their outside patio area is great for relaxing in the sun. I love this sign they posted on the small beach at the Faraway Inn, to help protect sand dollars and other seashore creatures. 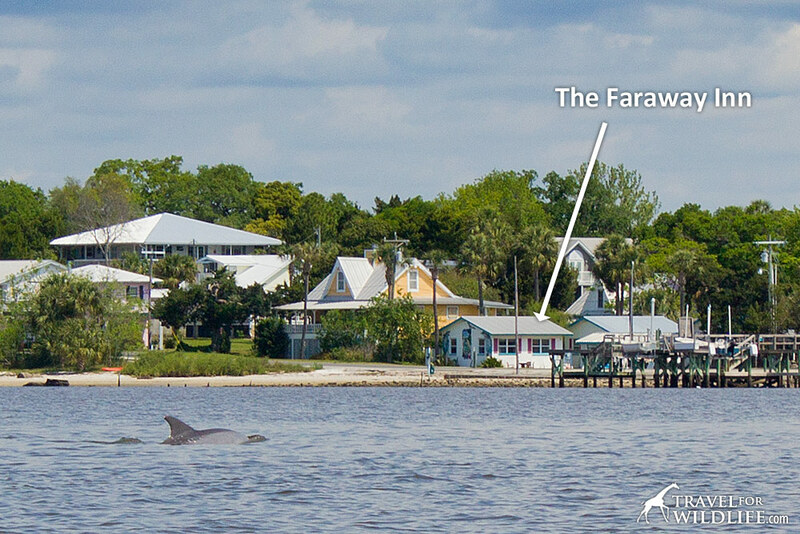 The Faraway Inn is very popular, so if you are too late to find a cottage here check out these vacation rentals in Cedar Key. To maximize the variety of species you’ll see, spring is an excellent choice, (late March and April). Horseshoe crabs are mating, Alligators are commonly sighted in the Lower Suwanee River NWR, and dolphins are active off shore. Most birds are entering their breeding season and you’re likely to see Osprey on nests. The weather is excellent and the mosquitoes haven’t quite set in yet. 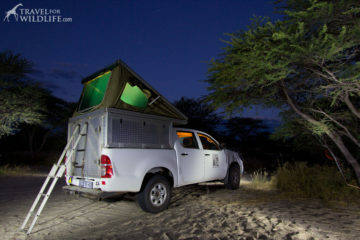 Winter is a good time to get away from the cold northern weather and there are very few bugs around. It’s also the best time of year to swim with manatees in nearby Crystal River (about one hour away.) Many of the large wading birds are wearing their beautiful breeding plumage. We also had great luck seeing dolphins in January. I have no direct experience of this but I’m going to take a wild guess and say it’s really hot in the summer and the mosquitoes will be at their peak. Fall is a good time to see deer activity in the Lower Suwanee River NWR. 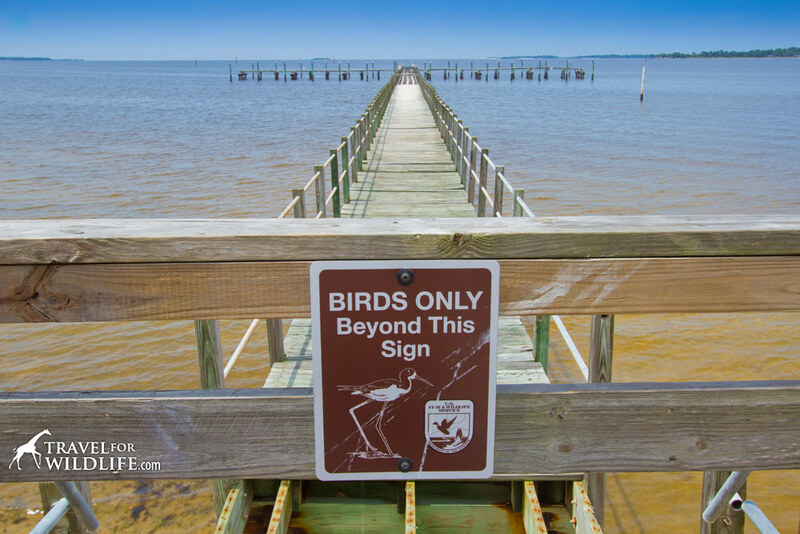 If you love Florida wildlife but hate Florida development, then Cedar Key may just be the perfect compromise for you. Kayaking with dolphins in Florida has never been easier! 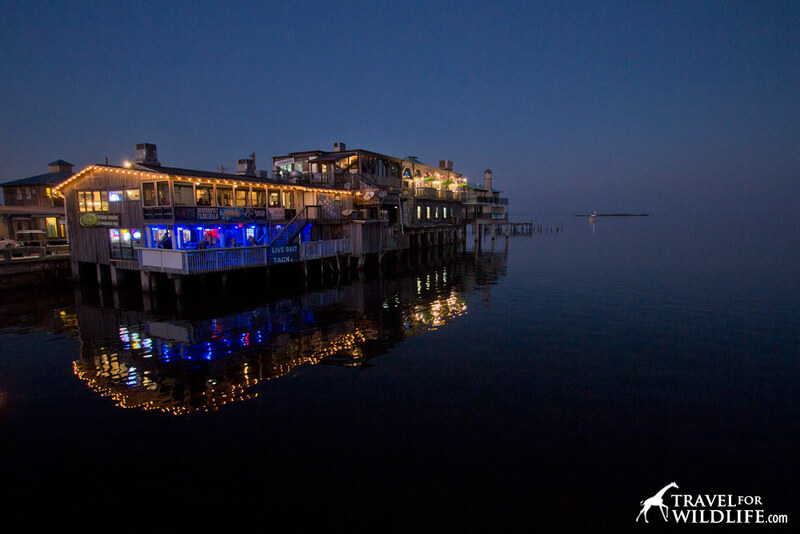 Give Cedar Key a try and let us know what you think in the comments below. 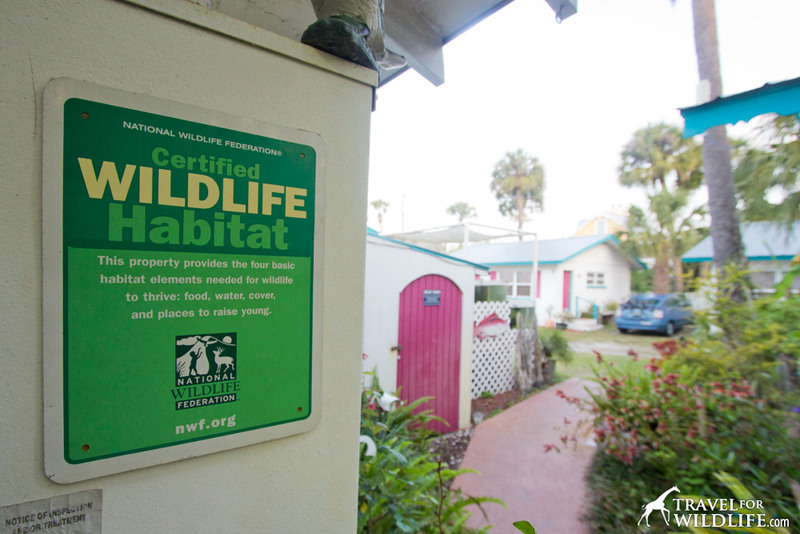 And if you’ve had other great wildlife experiences in or around Cedar Key, please let us know! Disclosure: Although we received free lodging from the Faraway Inn during our second visit to Cedar Key, all of the opinions expressed within this article are entirely our own. 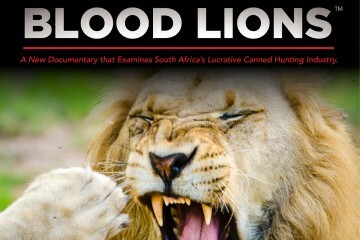 Great article & photos. We love Cedar Key. Have been vacationing there since 1999. Hope to move there one day. Our favorite place to stay is the Tropical Tranquility room of the Harbour Master Suites right there on Dock St. next to Steamers. Watch the boats, the dolphins, manatee occasionally, birds, etc. right from the comfort of our chair on the balcony directly over the water 24/7. 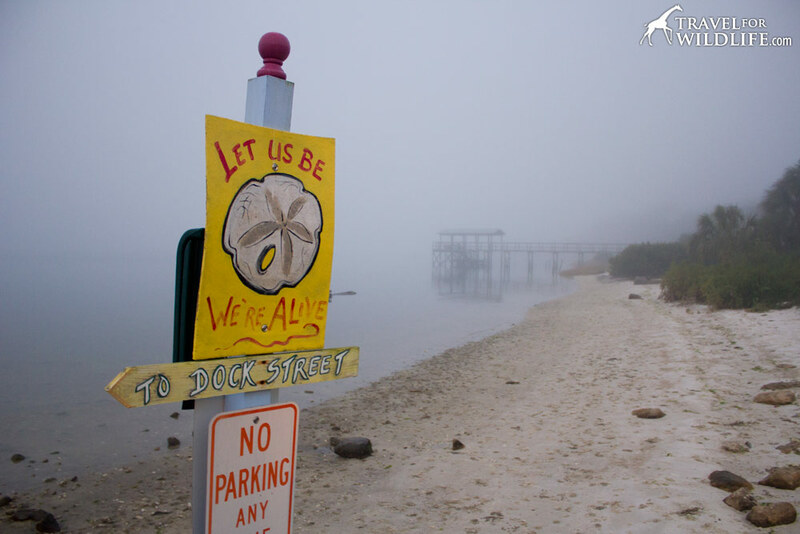 We would love to live in Cedar Key! It is so peaceful and calming. Hope you get to move there soon!